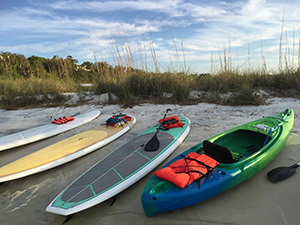 Join the Outdoor Gulf Coast Paddle Club and get unlimited on-site kayak and paddleboard rentals for one great price. Located at the Pensacola Yacht Club at the mouth of Bayou Chico, this is the perfect location for exploring Pensacola Bay and Bayou Chico. You can even paddle to The Oar House for lunch as a unique date activity or just to fuel up for a longer paddle! Anyone looking to get on the water on a regular basis without having to buy, store and transport equipment. Anyone looking for a fun way to get outdoor exercise as a change of pace from a gym. Bring a friend or two. Anyone with a business who would like to have kayaking, stand-up paddleboarding and more part of employees health benefits.